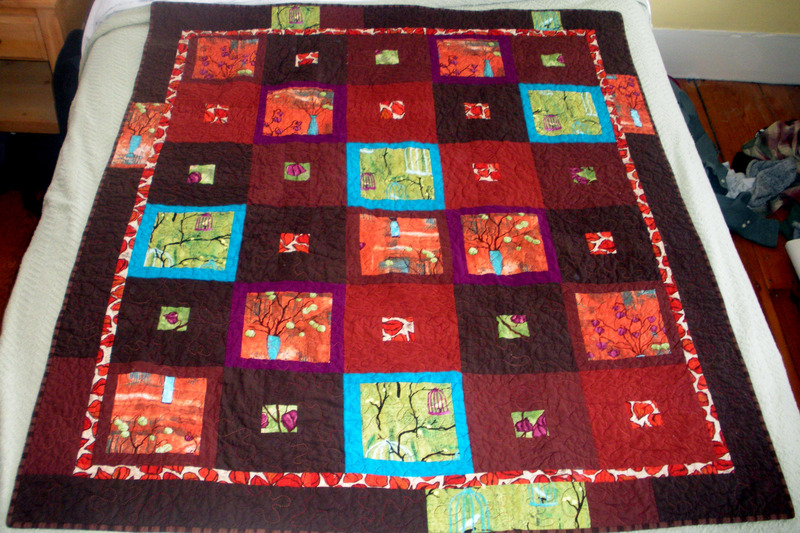 Finally… a real post and a finished quilt! I’m so excited to have a functioning computer again and the ability to post pictures and update that I don’t even mind showing this picture showing my husband’s clothes strewn on the floor. I finished this quilt around the new year. I love Laura Gunn’s Lantern Bloom line and wanted to find a way to feature the large scale prints. I’m also a recent convert to using solid fabrics. I improvised a simple block pattern and had some fun with this. I love the rich, warm browns and the pop of the blue and purple. 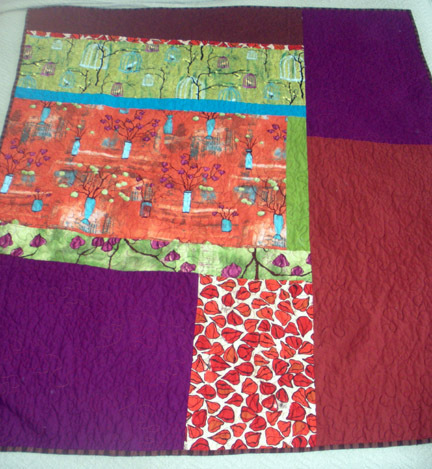 I also like pieced backs and finagled a way to use up almost every scrap of the fabric to compose the back. I also am in love with stippling. I keep thinking that the shapes look like seaweek fingers or something algae-like. Maybe I’ve just seen too much Spongebob lately. 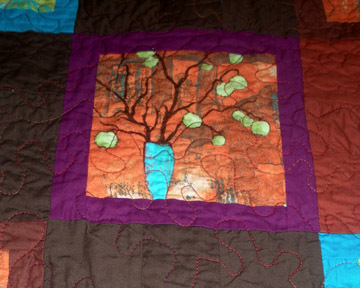 This quilt is for sale in the gallery. Thanks for your patience while my computer was kaput. I promise more frequent posts. 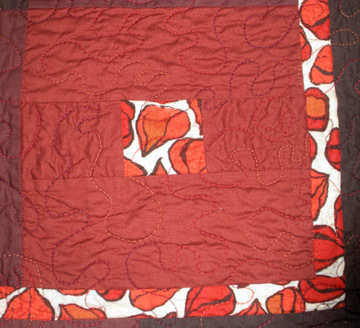 And thanks to the person who nominated me for a featured blogger with Park City Girl’s Quilt Festival. I’m honored. Watch for the feature on Amy’s blog. Becca lent me her copy of the new Hancock’s of Paducah catalog. I’ll try not to drool on it too much.